"LINX system is composed of a series of titanium beads, each with a magnetic core, connected together with independent titanium wires to form a ring shape like a bracelet of beads. 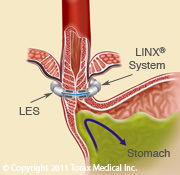 It is implanted at the lower esophageal sphincter (LES), a circular band of muscle that closes the last few centimeters of the esophagus and prevents the backward flow of stomach contents. The force of the magnetic beads is designed to provide additional strength to keep a weak LES closed. Upon swallowing, the magnetic force between the beads is overcome by the higher pressures of swallowing forces, and the device expands to accommodate a normal swallow of food or liquid. Once the food passes though the LES, the device returns to its resting state." Traditionally, surgical management of reflux entailed a stomach wrap called Nissen Fundoplication which is analogous to cinching a belt and is currently the gold standard. Trans-oral incisionless fundoplication is a newer approach to the Nissen fundoplication and is in essence an "internal" stomach wrap. It is only a matter of time to see whether this new LINX system is as effective if not more effective than fundoplication over a long period of time or whether it will go the way of the Dodo bird.